, bought with the last of my furfright money, and I can't be happier! Bumper the Deer has an irrational fear of cars. The problem is, he also doesn't remember how to cross the street safely. So here we see our poor friend, having been caught up in a little fender bender... well, a lot of fender bender. Unfortunately, he's been dragged down to the precinct because he's at fault for all that damage. Cute guys just can't catch a break, now can they? This idea's been a long time coming. 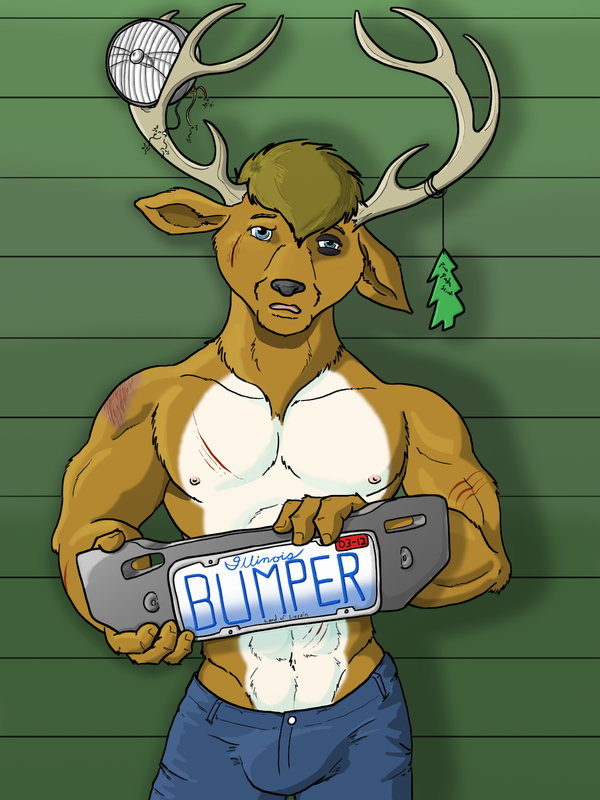 My alt character, Bumper the Deer, has been fleshed out over... wow, years now. He's become enough of a staple for me, I consider him a main character of mine, who deserves art. So, why not a badge! Extra special thanks to my friend Tsaro for helping me come up with the license plate idea!